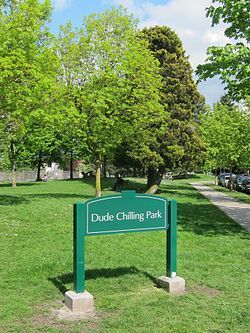 Dude Chilling Park is a sign installation, originally created as a prank, which now has official public art status in Vancouver, British Columbia, Canada. 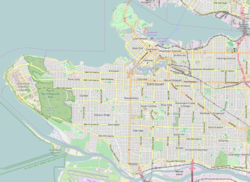 It is located at the 2300 block of Brunswick Street in the Mount Pleasant area of Vancouver in Guelph Park. The sign is located on the southwest corner of the park. In November 2012, the sign was created as a prank by local artist Viktor Briestensky, as a light-hearted reference to Reclining Figure, a public art piece by Michael Dennis installed in Guelph Park in 1991. Vancouver Park Board staff removed the sign, but local resident Dustin Bromley launched an online petition to save the sign. After 1,800 signatures of support, the Parks Board decided to reinstall the sign permanently on February 27, 2014, because it celebrates the unique characteristics of the park and neighbouring community. In September 2014, the installation was stolen but has since been replaced. International attention for Dude Chilling Park included U.S. late night talk show host Jimmy Kimmel who said "Between Dude Chilling Park and Mayor Ford, I might have to move to Canada." R&B Brewing, a local Vancouver brewery, created "Dude Chilling Pale Ale" in their year-round line-up as a tribute. ^ Meiszner, Peter (2014-02-26). "Dude Chilling Park sign to be installed tomorrow - BC". Globalnews.ca. Retrieved 2014-03-11. ^ "Dude Chilling Park sign gets official public art status". CBC News. Retrieved 1 March 2014. ^ Judd, Amy (28 February 2014). "Dude Chilling Park sign causing some residents to lose their cool". Global News. Retrieved 11 March 2014. ^ "Vancouver's Dude Chilling Park sign goes missing, again". CBC News British Columbia. Canadian Broadcasting Corporation. Aug 31, 2014. Retrieved September 1, 2014. ^ "JIMMY KIMMEL LOVES VANCOUVER'S DUDE CHILLING PARK SIGN (VIDEO)". Retrieved 11 March 2014.